Is he the world longest reigning olympic champion? 112 years until golf returns to the Olympics in Brazil, 2016! He is one of the oldest gold medal winners (at 46 ) - but not the oldest. Olympic gold medal is on display at Rosedale Golf Club, Toronto. Lyon's first love was cricket. In 1894, he made 234 runs before going out. It was a world record that would last 40 years. George Seymour Lyon (1858-1938) was the son of Robinson E Lyon and Sarah Maxwell. George was a famous amateur golfer in Canada in the early 1900's. He was the captain of Lambton Golf Club, Toronto, for 23 years and President of the Royal Canadian Golf Association in 1923. He was Canadian Amateur Champion eight times between 1898 and 1914. George Seymour Lyon won the Olympic gold medal for golf at the 1904 Olympics in St Louis, USA, at the age of 46. He remains the reigning Olympic Golf Champion as the event has not been held since 1904. Lyon set a Canadian record in the pole vault and also played baseball, cricket, and tennis before taking up golf when he was thirty-eight. 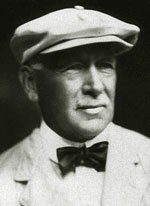 At forty-six, Lyon competed in the St. Louis Games in 1904, the only time individual golf was on the Olympic programme. A colorful figure, he told jokes, sang songs and occasionally did handstands while going around the course in the match-play elimination tournament. After beating Chandler Egan of the U. S. in the final, Lyon walked on his hands to the ceremony at which he was presented with a $1,500 silver trophy. A second Olympic gold medal in London 1908 ? 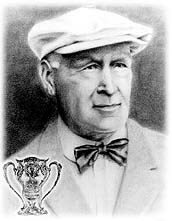 The Canadian Encyclopedia reports that after a dispute between US and UK golfers that "Lyon's was the only entry deemed acceptable by the Olympic Committee, who informed him that the gold medal was his by default. Lyon chose not to accept it, saying that he didn't feel he could accept a medal that he had not won fairly in competition."